If so, you’ve come to the right place! Whether you’re a semi-pro or a late night home studio adventurer, you probably want to make great sounding music and you don’t want to spend a boat load of money. Good thing you’re living through a true “revolution” in the recording industry. Here’s How The Recording Revolution Can Help You Make Better Sounding Music… Right Now! We live in an unprecedented age of recording music. With studio gear so affordable and computers becoming increasingly powerful, you can now have everything you need to record and produce top notch music in your home for practically next to nothing. This has opened doors for musicians and bands to push their creativity to new heights without the burden of being “on the clock” in a commercial studio. But are you getting the results you want? 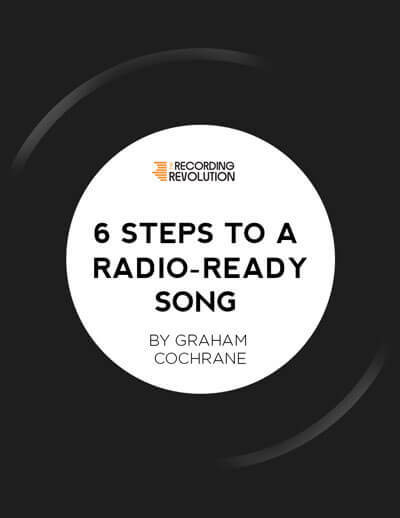 Subscribe to The Recording Revolution and get a $17 guide to creating a Radio-Worthy song from scratch completely free. You’ll get my years of schooling, training, recording, mixing, and failing all distilled into the most proven methods, tactics, mindsets, and philosophies so you can turn those lack luster recordings into radio ready mixes! And the cool thing is, you’ll actually get results. My email subscribers get my best information, stuff I never post on the site, and they take action. If you are someone who takes action and demands results, then my material is for you. I have a weird way of looking at home recording and mixing. Sure, my passion is to educate and empower a new generation of musicians and songwriters to make outstanding music with their home studio. But I live to break through the hype and marketing that tells people they need to spend more money if they want better results. I want to eliminate any and all excuses prohibiting great talent from making great recordings. And so often gear is just another excuse. Nah, you already have all you need to get killer sounding tracks. You just need a new way of thinking. The Recording Revolution will change the way you think about recording, mixing, and gear. If you’re ready to get started then sign up for the email list and let’s get to work. The Recording Revolution was founded by me, Graham Cochrane, a freelance recording and mix engineer living in Tampa, Florida. As a life long singer/songwriter and musician my passion for recording and mixing has grown from the bedroom studio, to university (where I studied audio production), to multi-million dollar studios, to fortune 500 software companies, and all the while freelancing for artists and bands world wide. If you’re looking for the truth about what it takes to get great sounding recordings and mixes in your home studio, then you’re going to love my way of thinking and teaching.